The Daily Gem Bonus: Giraffes, Clearance, Items, Winners, & More! Hi! Sorry for not posting, yesterday the Giraffe came out. New Animals Are Awesome! Aren't they so adorable? 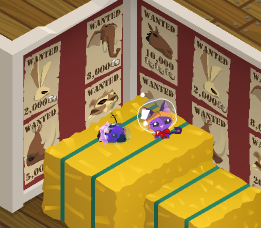 And also when a new animal comes out, that means... NEW PLUSHIES! It also that means a new den! I wonder what it will be. Also the new sea rocking horse was the winner. all items going with snowfort den. got bored of creating things by himself. he had to make all the animals, plants, and planets and set them in motion. By himself. He realized he didn't have to be alone-he could create a partner! The partner he created was a beutiful grey herion, witch he named Mira, the Sky Mother. Mira loved Zios deeply, and together they created their masterpiece: a lush land filled with moutains, oceans, forests, and all kinds of plants and animals. They named it Jamaa. Zios, in return for loving him and encourging him, made a grand statue of Mira and placed it in the township. Mira often visted this world and played with the animals. However, disater soon struck. Zios died, prehaps from old age, perhaps from dissese. Mira mourned over Zios for days, and the tears she cryed formed into black globs of mass.... Now know as phantoms. She asks to give credit to snowyclaw. Mira rarely appears in front of normal jammers. Since Zios left, she has been the leader of all shamans, and Jamaa. She lives up in the skies, and she is magical, her magic more powerful then a shaman's. She lives in a land far away, it takes a day or two for people to get there on foot. She has been known for her creativeness around Jamaa. She was born, rather hatched, on a warm spring day in May. Her mother, Ritcha, was sitting on her nest, when she felt a peck in one of her eggs. Imediantly, Ritcha moved off the egg and started watching. pick, peck, crack went the shell as Mira pecked her way out. She was a beutiful bird, and Ritcha knew imediantly what to name her. "You will be Mira!" she exclaimed. Mira responded to the name as if she had already knew it was her name. Sadly, the other eggs didn't hatch, so Mira was a only child, or shall I say, chick. One day, she was playing pretend in the woods. "I am the leader of all of you!" she told her pet rocks. But then she saw something unusual: a strange creature with a mask on was suddenly floating down to her! "You are just who I've been looking for!" it said. "What do you mean?" asked Mira. "Do you wish to be a ruler of a land, quite far away from here?" he asked. Mira nodded, unsure what this creature was getting at. "I am Zios, powerful ruler of Jamaa." it said. Mira flew up to him, and he took her to Jamaa. Later, Mira sculptured a glass statue of herself and placed it in Jamaa. She also was a good seamstress, and sewed a picture of herself on a flag, placing these creations in Jamaa. And also there's a new Bunnies Only Party! Be sure to vote on the poll when I change it! Hamster: Are you sure about this? Cat: Well of course I am! We will be SPACE..! Cat: What do you mean COOL? Cat: Whadda you mean cool? Hamster: Didn't I just tell you? Cat: No. Whats your name? Sis, you should honestly write your own stories... bassically 96% of your story is from snowyclaw's... some words differentized. But sinc eit is the only story besides mine, I have to vote for it... but no offence, mine is a bit more umm... original.